This cute little pencil dress is one part chic and one part sweet. The Dynamic Duo Chiffon and Crochet Lace Pencil Dress is fully lined, except at the top back, which is semi-sheer. The top part of this dress is made of chiffon and has a crossover V neckline with pleated chiffon details. The attached skirt is made of crochet lace and has a fitted pencil cut. A hidden side zipper completes this look. The Dynamic Duo Chiffon and Crochet Lace Pencil Dress would look nice paired with black or ivory pumps. This is a dress you can wear in a business casual work environment and then out for drinks afterwards. Try pairing this dress with a fitted black cardigan if you need more coverage. Details: Fully lined, except at top back. Hidden side zipper. 100% polyester. Contrast: 100% cotton. Lining: 100% polyester. Hand wash cold water. Do not bleach. Line dry. Iron low. Do not dry clean. Small measurements: Length from top of shoulder to hemline: 36". Bust: 32". You have added Dynamic Duo Chiffon and Crochet Lace Pencil Dress in Black/Ivory into Wishlist. You have added Dynamic Duo Chiffon and Crochet Lace Pencil Dress in Black/Ivory for Stock Notification. You have set Dynamic Duo Chiffon and Crochet Lace Pencil Dress in Black/Ivory as a loved product. 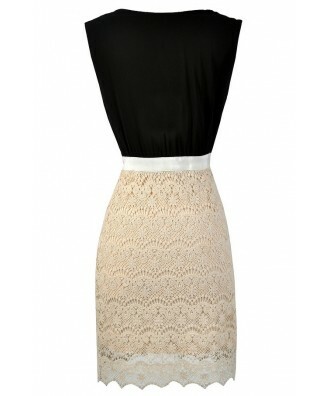 You have removed Dynamic Duo Chiffon and Crochet Lace Pencil Dress in Black/Ivory as a loved product.